I love dogs and my husband and I have 3 golden retrievers! They are our kids! We got our dogs when they were puppies and trained our dogs (with the help of Petsmart puppy classes) and everyone says they are so good and quiet. They only bark when someone comes to the door or if something is going on outside that is not the norm. Very good watch dogs! If you need your dog watched overnight, that is something we can do at our home. 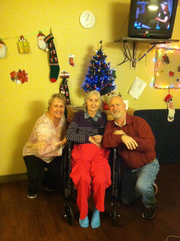 The picture is from this past Christmas of my husband and I with his mother in the nursing home.